Size: 18 inches gun. It requires 6 MM plastic round bullets. All parts of the gun are detachable. Please note: It contains infrared collimator. Also contains torch for low light play. 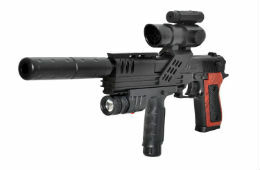 Sunshine Exclusive> NOTE: This is a toy gun and the accuracy cannot be deemed suitable for target based games.